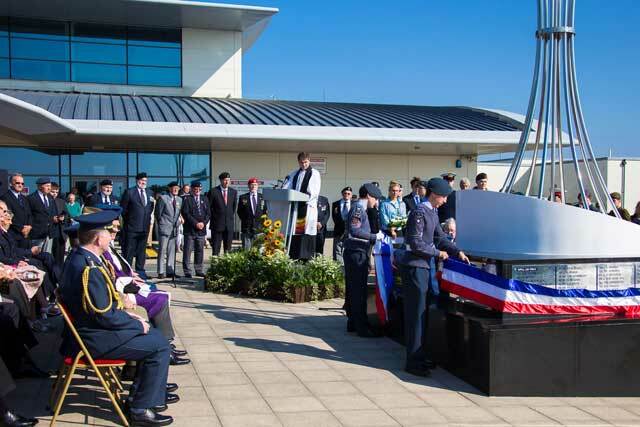 The role of Allied airmen in World War Two was marked by the dedication of a memorial outside Guernsey Airport on 9th September 2015. It follows more than 50 years of research into the subject by Channel Island aviation historian and Society Archivist John Goodwin, which has found 153 names of those airmen killed in Bailiwick of Guernsey waters during WW2. 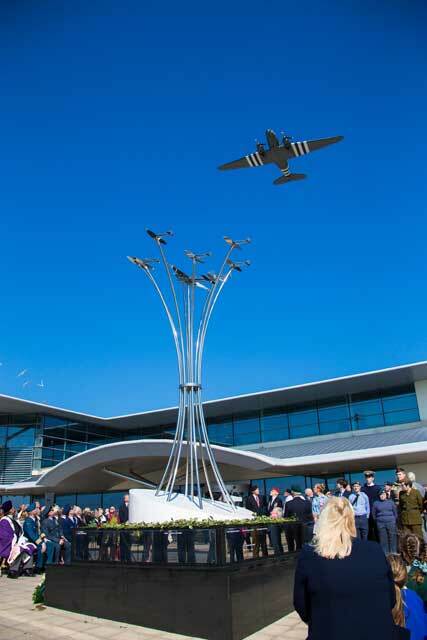 The 6m (20ft) tall Allied Aircrew Memorial made as a stainless steel sculpture features representative models of a USAAF B-17 and seven Spitfires. Written around its base are the names of the airmen known to have died off Guernsey, Alderney, Sark and Herm many of whom have no known grave. 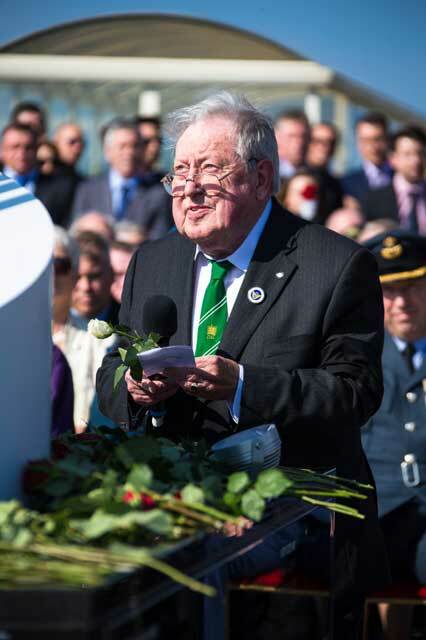 John Silvester, chairman of the Allied Aircrew Memorial Committee, said it was fitting the memorial was dedicated in the 70th anniversary year of Guernsey’s liberation from German occupation in World War Two and dedicated around the 75th anniversary of the Battle of Britain. He said it had only been possible due to help from local contractors, who offered their expertise for free, meaning the memorial cost about half of the originally estimate of £125,000 and of course the generosity of the people of the Bailiwick. The design of the Memorial involved many local experts and professionals: architects, structural engineers, designers, advertisers, metal welders, concrete experts, builders and lighting designers. The design was always intended to be both striking, appropriate and to match the look of Guernsey’s modern airport. The cost of the monument had been raised by local donations and much of the work carried out ‘pro bono’ by local companies. The very moving and thoughtful dedication service was conducted by the Vice-Dean of Guernsey The Reverend Mike Keirle and during the service the names of the 153 Airmen were read out by six of the Lt. Governors Cadets, whilst a gentle lament was played by a single bagpiper and simultaneously children from the two schools in the Forest Parish, the Forest Primary and Le Rondin School placed a single red rose around the memorial one for every Airman. The last three names were read out by John Goodwin before he placed a single white rose for peace on the memorial. 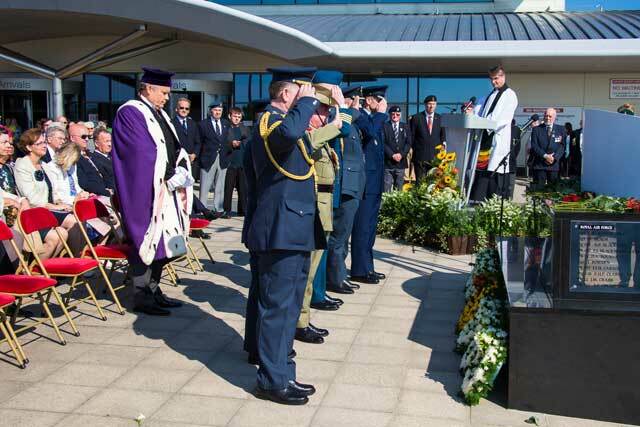 The Bailiff Sir Richard Collas representing the people of the Bailiwick of Guernsey laid the first wreath followed by wreaths laid by the six Airforce attaches, representatives of the Nations of those on the memorial. The last post was sounded and seconds after the closing speech was a well timed dramatic fly past the memorial by The Battle of Britain Memorial Flight Dakota flying over the memorial. Originally planned to have been the Lancaster, Spitfire and Hurricane the Dakota was a last minute stand-in after the original flight went technical showing the fragility of the aircraft from WW2. 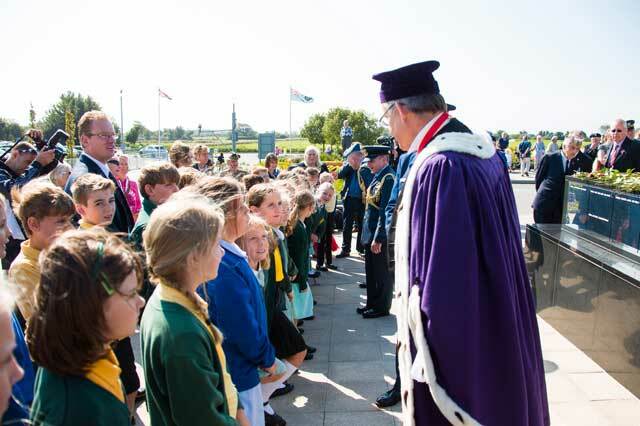 Following the service the dignitaries meet the children and then unveiled six tress planted in memory of the six nations represented on the memorial. Of course many will know the Patron of the Allied Aircrew Memorial fund was the late Air Marshall Sir Peter Walker CB CBE, who died just days before the memorial was officially dedicated and so in tribute to him the last words should be his written before his untimely death. “I congratulate everyone involved in the production of this permanent memorial to those aircrew of all the nations who lost their lives in Bailiwick waters during the course of World War II. A list of those named on the memorial, compiled by John D Goodwin, can be found in the Roll of Honour. 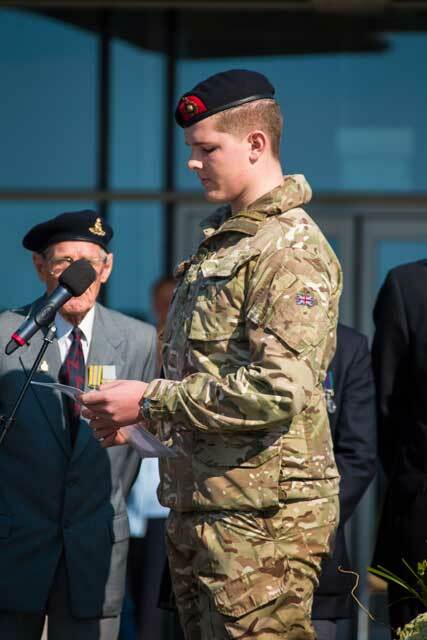 Two Guernsey Air Cadets to a drum roll ceremoniously unveil the names. 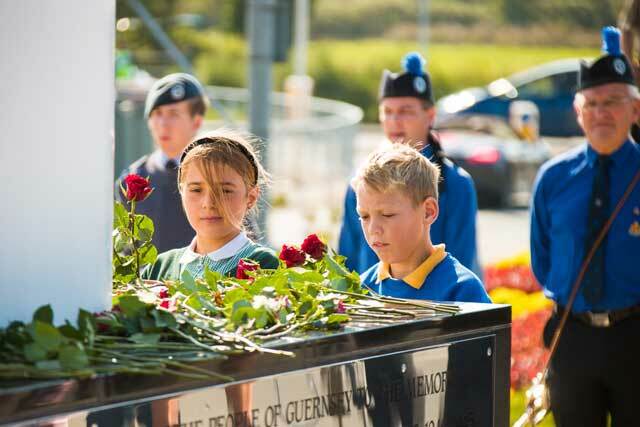 Two of the 36 children from the Forest Primary and Le Rondin School placing a single red rose around the memorial one for every man named. Ruri Johnson one of the six Lt. Govoners Cadets who read out the names of the fallen. John Goodwin at the memorial reads the last three names and places a single white rose for peace. The six air attaches of the RAF, RCAF, RAAF, RNAF, USA and Czech Republic laying their wreaths after the Bailiff salute the memorial. The Battle of Britain Memorial Flight Dakota flying over the memorial. The dignitaries meet the children who made the event so special linking the past with the present and into the future.